We are delighted to announce that RFT Services have engaged Sky Cam East to carry our aerial roof surveys on the properties the firm manages. Roofing surveys have always presented a cost and convenience challenge to property owners and managers. The expense, inconvenience and time frame of scaffolding, the risks associated with operatives working on roofs etc. The solution that for the vast majority of roof survey requirements is the deployment of remote aircraft – UAVs or Drones. In professional hands, a ‘UAV’ (Unmanned Aerial Vehicle) can acquire high definition images or video at a fraction of the cost, in a fraction of the time and with very little to no inconvenience to residents, and present their findings in an ‘easy to navigate’ interactive graphical document. Forward looking companies such as RFT Services have tested the technology and are now utilising Sky Cam East to provide roof surveys. 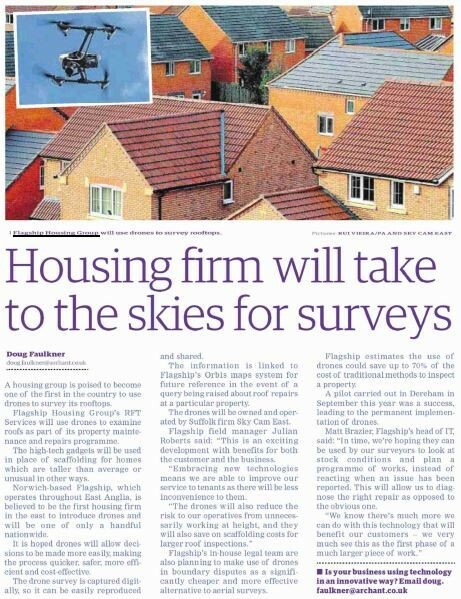 Sky Cam East Managing Director James Hazell said, “We are thrilled to be able to present this tried and tested solution to such a reputable company as RFT Services and it’s refreshing for an organisation to be putting it’s clients and residents first. 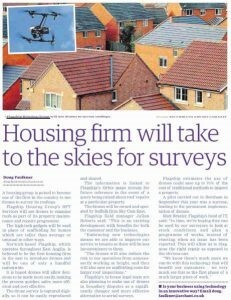 For further details of aerial property surveying please contact us.